Rose Champagne is sometimes called pink Champagne, although the color can vary drastically from a very light salmon or copper color to all shades of pink to a fairly dark and hearty rose pink. Unlike other types of rose wines, Rose Champagne is a very serious wine. This is not to say that there are not very good rose still wines, such as in the South of France, but many rose are sickly sweet and insipid. There also also some very good Rose sparkling wines made in regions other than Champagne of course. Rose Champagne tends to be a very dry Champagne, and perhaps the driest is Krug Rose, a multi vintage blend. They go very well with foods, taste fantastic, look very pretty in the glass, and also are quite romantic in the proper setting with the right person. 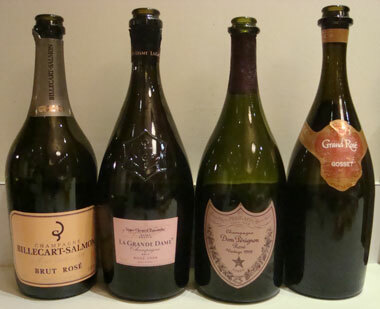 They also tend to cost quite a bit more than regular champagnes as they are more expensive to produce. There are Non Vintage, vintage, and prestige cuvees available. Rose Champagnes were first produced in 1777 by Veuve Cliquot, and in fact their La Grande Dame Rose 1988 is one of the most breathtaking roses, perhaps the most breathtaking, that I have ever had. They were very popular in the mid 1800s and again in the early 1900s, and now have a fairly small but dedicated following. Many Champagne producers and most of the big ones have at least one rose today. There are two methods for producing Rose Champagnes, the traditional method and the skin contact method. With the traditional method, by far the most common, a small amount of regular Pinot Noir (from Champagne of course) is added before the secondary fermentation, around 10 to 15 percent commonly. This is the simplest and least expensive method. The second method, the saigneé or “skin contact method” involves leaving the clear juice of the black grapes on the grape skins for a brief time to get some color. It’s tough to always get a consistent color using this method and few producers use it, although Laurent-Perrier, Louis Roederer, Guy Charbaut, Tattinger, and Larmandier-Bernier among others do. So what does it taste like? Of course there are wide variations, but I tend to find they are drier Champagnes with tastes and aromas of berries, flowers, and fleshy red fruits. In particular I often find wild strawberries. Most roses are designed to be drank young while they are fresh, although some prestige cuvees age remarkable well such as Dom Perignon and Cristal Rose, two very expensive Champagnes. Dom Perignion Rose is wonderful, although I personally enjoy it on the young side. Although a massive Cristal fan, I am not a big fan of Cristal Rose although I have had it a few times. It is certainly excellent, and perhaps I simply had it too young? I’ll be sure to retry it, but based on the cost and so many other Champagnes to enjoy, it may not be soon! Just a few well worth seeking out and trying include NV Billecart-Salmon Brut Rose (a good deal! ), Nicolas Feuillatte Rose (another good deal), NV Larmandier Bernier Rose De Saignee, Billecart-Salmon Elisabeth Salmon Rose, Krug Rose (multi vintage), Dom Perignon Rose, Veuve Clicquot Ponsardin Rose Reserve and Veuve Clicquot La Grande Dame Rose. Of course there are also sparkling rose wines from other regions as well you may enjoy and want to explore, as well as a sea of Grower Roses we have barely touched on.